Possibly the biggest health challenge facing Canadian federal and provincial governments as the senior population soars over the next 20 years, will be the growing rate of arthritis. As co-leaders of the National Arthritis Awareness Program, Arthritis Consumer Experts (ACE) and the Arthritis Research Centre of Canada (ARC) have met primary care physicians, pharmacists and medical educators who are seeing a growing number of aging baby boom Canadians coming to their clinics with questions about arthritis. Indeed, baby boomers everywhere are just starting to approach what they thought they never would: old age. An increasing number of people born between 1946 and 1965 will be eligible for senior citizen discounts at restaurants, movies and public transit. And many have sore, creaky joints, the ultimate badge of aging, but this demographic is not fond of the stereotypes associated with aging. In Canada, baby boomers make up nearly one-third of our population and 80 percent of healthcare product buying. If this large group intends to keep up their healthy lifestyles and youthful attitudes, they need to immediately take steps toward early diagnosis and prevention of arthritis. At the Primary Care conference, we met Leonard Wolf, a family physician from Kamloops, who at 49 is on the younger end of the baby boom spectrum. When playing with his dogs or his two school-aged boys, he seems younger still. But even at his age, he is no stranger to the pain of arthritis: he has severe bursitis in each elbow. And, thanks to an incredible list of rugby and skiing injuries from his high school and university days, it may only be a matter of time before osteoarthritis creeps into his knees. “I am very concerned I won’t be able to do the things I want when I retire,” says Leonard. People in Leonard’s generation are putting a new face on arthritis and at the same time, putting into sharp focus the burden of arthritis on the Canadian economy. Arthritis Consumer Experts and the other members of the Arthritis Alliance of Canada (AAC) have been vocal about the gap in knowledge related to the impact arthritis will have on Canadians over the next few decades. The Alliance includes more than 20 member organizations from across Canada, bringing together arthritis consumers and consumer organizations, arthritis healthcare professionals, researchers, funding agencies, governments, voluntary sector agencies, and industry. 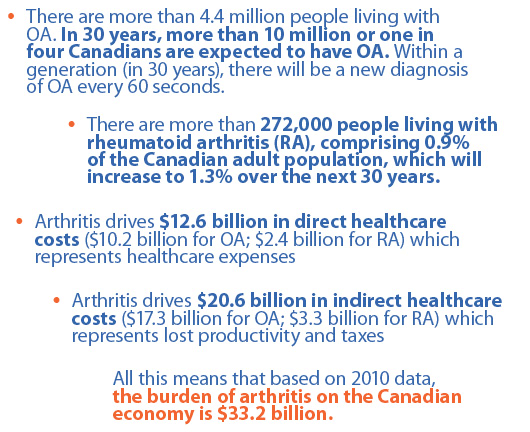 In October 2011, the AAC released a report entitled The Impact of Arthritis in Canada: Today and Over the Next 30 Years. The report examines the economic and health benefits that would result if changes were made to the treatment and diagnostic processes for arthritis in Canada. It also looks at the consequences of continuing with current approaches and practices and not taking action to improve the treatment and diagnosis of arthritis. The report examines the economic and health benefits that would result if changes were made to the treatment and diagnostic processes for arthritis in Canada. The report also examines the potential for savings both to the healthcare system and the Canadian economy if certain potential interventions are applied. Specifically, the report examines the benefit of implementing solutions for reducing the burden for people living with osteoarthritis and rheumatoid arthritis. For OA, the report considers the benefit of earlier interventions through total joint replacement, reducing obesity, and adequate pain management. For RA, the report looks at the potential improved outcomes of early diagnosis and treatment and easier access to Disease Modifying Anti-Rheumatic Drugs (DMARDs), or access to Biologic Response Modifiers (Biologics) for those who do not respond to DMARDs. What does this mean for Leonard Wolf and the rest of Canada’s baby boomer generation who represent the grey tsunami that is about to hit our economy? That is, baby boomers will be the most physically active senior generation we have ever seen. For arthritis prevention in aging athletes and fitness enthusiasts, it is important to remember that medical attention and rehabilitation after injury are also crucial to preventing arthritis types such as osteoarthritis. Such numbers should sound a warning to boomers everywhere. Whether or not they have arthritis, now is the time to start taking care of their joints. Leonard Wolf told ACE, at the Primary Care Conference, that he plans to trim down his rugby-player physique, a step that would take some of the strain off his knees, hips, and ankles. Most of all, he intends to keep moving -- sensibly. Whether it’s a brisk walk with the dogs or a bike ride with his boys, regular exercise will keep his joints functioning longer. With these kinds of regular physical activity, muscles become stronger, therefore better able to support weight-bearing joints, which in turn helps minimize pain and stiffness. Leonard Wolf’s story and the findings of the AAC report arrive at the same conclusion: arthritis is a chronic disease that will continue to place an incredible burden on society if left unchecked. Already in Canada, we have seen national strategies or models of care developed successfully for cancer, HIV-AIDS, and diabetes. The AAC report concludes that Canada needs a similar National Framework for Arthritis that increases awareness and improves the way people are diagnosed and treated. The goals of the National Arthritis Framework are to create evidence-based national standards and strategies for early detection, diagnosis, treatment, and prevention which will lead to better outcomes and improve the lives of people with arthritis, and their families. 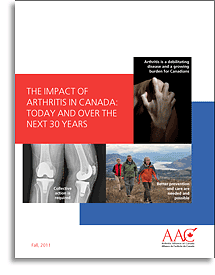 Please take the time to read the AAC report and consider the consequences of arthritis for Canadians living with the disease and on society today, and the impact it will increasingly have over the next 30 years. Arthritis is the most burdensome chronic disease there is, and only by recognizing that and the strain of this debilitating disease on the human spirit, the public purse and the broader economy can we move toward better outcomes, lower costs, and improved productivity. By prioritizing arthritis as a serious chronic disease, Canadians and their governments will be able to make better use of valuable healthcare dollars. Together we can build a National Framework for Arthritis and implement change. Key elements in this year’s National Arthritis Awareness Program, the two free medical apps represent cutting edge tools for communicating arthritis research breakthroughs and news to scientific audiences and to people who live with arthritis. In the first month after they were launched, there were over 3500 downloads. ArthritisID was the “Featured app” in the iTunes store for September and ranked in the Top 20 in “What’s Hot” in medical apps for four consecutive weeks post-launch. The apps have consistently placed in the Top 10 of the “Top Free” medical app download category between October 2011 and December 2011. Over the past 12 months, ACE received unrestricted grants-in-aid from: Abbott Laboratories Ltd., Amgen Canada, Arthritis Research Centre of Canada, Bristol-Myers Squibb Canada, Canadian Institutes of Health Research, GlaxoSmithKline, Hoffman-La Roche Canada Ltd., Merck & Co. Canada, Novartis Canada, Pfizer Canada, Sanofi-aventis Canada Inc., Takeda Canada, Inc., and UCB Canada Inc. 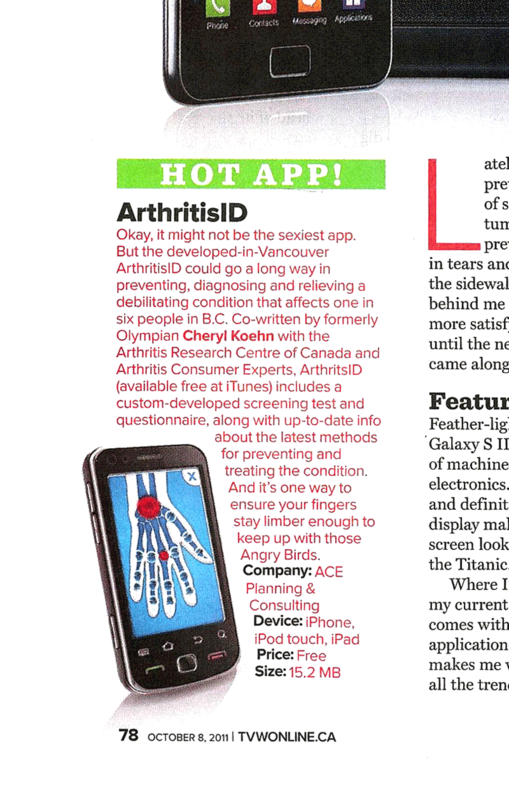 ACE also receives unsolicited donations from its community members (people with arthritis) across Canada.